So, I really love apple season, too! 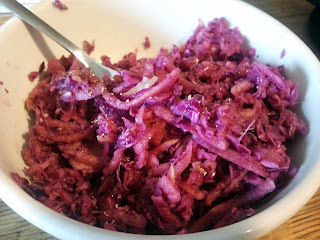 Slice cabbage & apples into very thin strips ( food processor is great for this.) Toss with lemon juice and spices. Allow to marinate for 30 minutes or overnight. Place mahi mahi on top of a large sheet non-stick aluminum foil. Blend garlic, ginger, and pepper loosely. Optional to whisk together with olive oil. Top the fillet with the seasonings. Place tomato slices on top of seasoned fish. 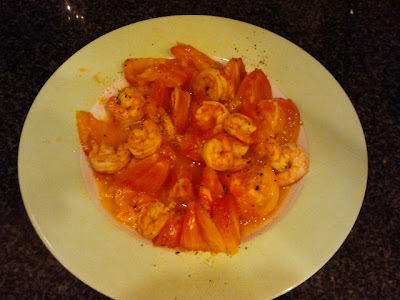 Drizzle the squeezed lemon juice all over your tomatoes and fish. Close up aluminum foil into a pocket so that the top and ends are completely sealed around your delicious fish. Sprinkle thick sea salt to taste all over your tomatoes after you pull it out of the oven and enjoy! Ten years ago in Belize, we caught live lobsters in the shallow waters and made our way to the shore, where we wrapped the tail meat in foil with wedges of tomatoes and lemons and sprinkled them with garlic salt. After cooking them in beach campfire, we enjoyed one of the most delicious meals of my life! This recipe really reminds me of that dinner and the spicy ginger helps make it perfect for winter! Simmer a little water (and maybe a titch of oil if you'd like) in a pan at medium heat, stir in and whisk the cayenne, paprika and cumin together. Now the shrimp should be good and cooked and spicy! Obviously, this is incredibly easy to make and scale, and only takes about ten minutes total! It is also quite, quite tasty!